NEW YORK--(BUSINESS WIRE)--The New York City Hemophilia Chapter (NYCHC), Octapharma USA and international non-profit Save One Life will present the first New York City screening of "Bombardier Blood" at 1:30 p.m., Sunday, April 14th at the AMC Empire 25, 234 West 42nd Street in Times Square. 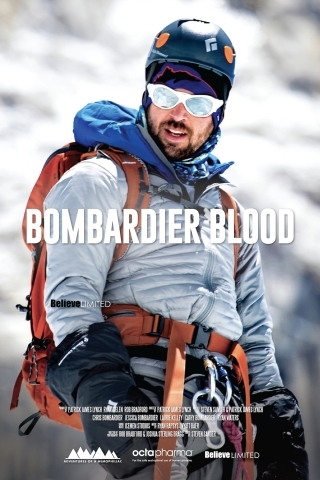 Octapharma is the sponsor of the free NYC screening and “Bombardier Blood,” the documentary that features the incredible journey of Chris Bombardier, the first person with hemophilia to climb Mount Everest and the Seven Summits. A reception after the screening will include a question and answer session with Bombardier, now Executive Director of Save One Life, and the film’s Director Patrick James Lynch of Believe Limited. “Bombardier Blood” Executive Producer Alex Borstein, the two-time Emmy-Award winning actress best known for her work on “The Marvelous Mrs. Maisel” and “Family Guy,” has been invited to join the event as well. In addition to the film and the NYC screening, Octapharma also sponsored Bombardier’s climbs of Mount Everest, the world’s tallest peak, and Mount Vinson in Antarctica. NYCHC is host of the Times Square event. Please visit the www.nyhemophilia.org for ticket information. Octapharma USA has created the Facebook page Supporting Bleeding Disorders to share inspiring patient stories and educational information. Please visit the page at www.facebook.com/SupportingBleedingDisorders/. To learn more about “Bombardier Blood,” please visit www.bombardierblood.com. The New York City Hemophilia Chapter (NYCHC) is a non-profit 501(c)3 organization incorporated in 2008 to address the needs of the bleeding disorder community in the greater NYC area. NYCHC’s mission is to foster a sense of community amongst people affected by bleeding disorders in the greater NYC area, and to improve their health outcomes and quality of life. For more information, please visit www.nyhemophilia.org or call (212) 382-2974. Save One Life is a nonprofit that offers direct financial assistance to people with bleeding disorders in 13 developing countries. Hemophilia is a devastating inherited blood disorder that can still cause severe pain, crippling and even death when untreated. Developing countries usually cannot purchase the blood-clotting medicine needed to sustain life. People with hemophilia can be supported financially for only about a dollar a day. Save One Life offers direct sponsorships, scholarships, micro-enterprise grants and camp funding. Save One Life was founded in 2000 by Laureen A. Kelley, author and president of LA Kelley Communications, and a mother of a child with hemophilia. For more information, visit www.saveonelife.net or call 978-352-7652. The NYC Hemophilia Chapter, Octapharma USA & Save One Life present the first NYC screening of "Bombardier Blood" April 14th in Times Square for free.